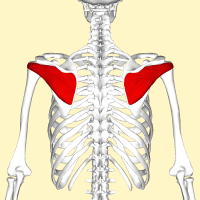 A thick, triangular muscle; one of the 4 muscles which comprise the Rotator Cuff of the shoulder. The infraspinatus fossa of scapula, with some fibres arising from the infraspinatous fascia which covers the muscle and separates it from Teres Major and Teres Minor. The posterior aspect of greater tuberosity of humerus, and the capsule of shoulder joint. Suprascapular and circumflex scapular arteries. Infraspinatus is the main external rotator of the shoulder joint. It assists in producing shoulder extension. It provides the primary muscle force for external rotation of the shoulder. Along with the rest of the Rotator Cuff muscles it provides stability to the shoulder complex. Intraoperative evaluation of blood flow for soft tissues in orthopaedic surgery using indocyanine green fluorescence angiography: A pilot study. [Correlation analysis between rotator cuff tear and the superior migration of humeral head].